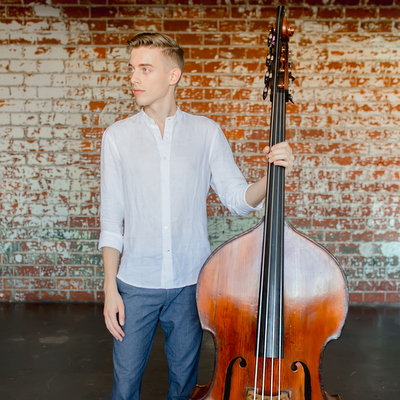 Born into a musical family, Austin Lewellen played several different instruments before settling on the double bass. Well-versed in both orchestral and contemporary music, Austin has held fellowships at the National Orchestral Institute in Maryland, the Spoleto Festival in South Carolina, the Internationale Ensemble Modern Akademie in Austria, and the Lucerne Festival Academy in Switzerland. An alumnus of the Oberlin Conservatory, he is now a graduate student of Paul Ellison at the Shepherd School of Music. Outside of his studies, Austin is a Da Camera Young artist, a substitute musician with both the San Antonio Symphony and the Fort Wayne Philharmonic, and a founding member of Loop38, a Houston-based new music ensemble in its third season. When he is not playing bass, you can probably find Austin running in the neighborhoods around Rice University, or grinding coffee at the House of Coffee Beans.